The US-India trade target is about $500 billion. How can trade between the two largest democracies be enhanced? US total bilateral trade [goods and Services] with India was $126 billion in 2017, up by 10.4 % from $114.2 billion in 2016. Bilateral trade witnessed an average 5.6% annual growth rate for previous five years. We see this trend is moving forward. It is going to be up for multiple reasons; one of the reasons is the defence side and the other is on the energy side. India is going to import this year roughly $120 billion of energy globally, and given the situation in Iran with sanctions, India is looking at the US LNG, coal and crude, and all of them are up by 400 percent this year. India is concerned about the US sanctions against Iran. How do you view this development? India today is importing roughly 16 percent oil from Iran, and because of the specific crude, the refineries (in India) are made to process Iranian oil itself. Our advocacy to the US administration is that don’t make November as a deadline and give more time to that. Iranian oil and terms and condition are quite friendly to India, and if you provide the same terms and condition, India will switch. Our bigger issue is that India has invested roughly half a billion dollars in Chabahar Port, that gives us the access to Afghanistan. A lot of goods India is moving to Afghanistan are beneficial for the US troops also. So the US also benefits from that. My gut feeling is that there will be some exception on the Chabahar Port itself. What would be the impact on India of the US-China trade war? India stands to benefit from the trade war between the US and China. What we can see is that China is taking a softer stand towards India. Last year China allowed import rise after 25 years of conversation – the same thing on the pharma side. So China realises if it continues the trade war with the US then it has to have local partners, and India is definitely a neighbour with a big market. So I think things are moving between India and China also. What is the scope for India and the US work together to propose institutional reforms after loggerheads at WTO? The Trump administration does not believe in multilateralism; it focuses more on bilateral. You can see the WTO languishing under this administration. However, India is a firm believer of the WTO process, so that is going to be a challenge. This administration is saying, ‘how do we sign bilateral deals’. I think in some ways this administration is right because a country like China took advantage of the WTO and leveraged on the currency side, giving subsidies in discrete manner to companies and get market share. Today China still wants to be treated as an emerging market and get all the benefits. The Trump administration is saying that ‘you have a $500 billion trade surplus from us every year and while we tax your cars at 2.5 percent and you tax 25 percent on our exports. You have got to have a reciprocal relationship’, and somewhere I agree with that. This year, there have been talks of a free trade agreement (FTA) between India and the US. Your views? It is too early to say. The FTA is a very complex process. You are dealing with not one good but thousands of goods. My thinking is that it will take years to conclude the FTA. Although the India-US relationship is strong, there is visible friction when it comes to trade. What are the key trade and economic irritants between the two? Our position is: any kind of tariffs either India puts or the US put are not good for business, not good for the consumers. So we firmly believe that there should not be a tariff. Currently, the irritant is, there is a price control over medical devices in India, while in the US we have GSP towards Indian imports. There is an issue on the tariffs from the US side on steel and aluminium and renewable [energy] export from India. While India exports automobiles taxed at 2.5 percent, when the US exports automobiles to India, the tax can be imposed from 25 to 100 percent (in India). Is any unpredictability of the domestic regulatory environment in either country hurting the trade? Relationships of the nations are built on a certain amount of predictability. If you take that predictability and transparency out, it does put a lot of stress. For example, we had the e-commerce policy draft release yesterday and it is a policy which targets MNCs investing in India. It kind of penalises them while it encourages local e-commerce companies. I have no issue with trying to grow local e-commerce companies. At the end of the day, the customer is the king, let the customer decide from where they want to buy. If somebody can provide you with cheaper products and excellent services and assurance that you can return it, more power to them. The moment you start controlling prices, the moment you start saying you cannot give so much of discount or you can’t sell in bulk, then as a government, you are getting into managing a business, and that's not healthy. During the four years of this government, India has witnessed a number of ‘disruptions’ in the economy, especially GST and demonetisation. How is the NDA’s economic management perceived in the US? The US sees this administration [Modi government] in a very positive way in two broad areas: the economic reforms, and projecting a very consistent foreign policy. If you look at this administration, it has brought India’s stature in every arena like G20, G8 and BRICs to the level-playing field where India is seen as an equal partner. In terms of economic reforms, they have consistently gone out from GST to RERA to the bankruptcy code, and done a great job. To be able to undo some of the socialist processes of 70 years does take time. So investors are quite patient and also positive on this government as they seem to be moving in the right direction. For example, there are no major corruption scandals which give us a lot of encouragement that this government is quite focused on making sure corruption is not happening, it may be happening but at least not on the top level. How do you see the change in perception about India? It is tremendous. This government has managed that very well. Modi was one of the most effective at the summit he had with Trump. The way they handled the Doklam issue sent a powerful message, the way the government conducted a surgical strike [against terrorists, in Pakistan-administered territory] sent a very strong message that this government will stand for the sovereign rights of the country. The ‘Make in India’ programme and the call for ‘Make in the US’ can create a conflict between the two sides. How can it be a win-win for both? I don’t think it is conflicting, it is complementing for both the countries. For example, we are talking about other F-16, or F-18 [Boeing fighter jets] to be made in India but a large portion of components will come from the US and it creates jobs on both sides. Today India has placed orders for roughly 1,000 planes in the US on the civilian side and that is creating jobs in the US. Indian IT companies generate revenues of approximately $60 billion from the US and that is creating jobs in India. What about the issue of H1B visa? What is your take on this? It is a complex issue. Let me give you three perspectives on H1B: one is from the US company’s perspective. Indian IT companies have brought 65,000 H1B visas [holders] per fiscal and trillion dollars savings to the US companies in the last 18 years. Another thing is the US companies have become efficient, effective and competitive leveraging Indian tech workers, and we [the US] have a shortage of over a million of IT workers and as the economy is growing 4.1 percent, demand for IT professionals is also growing strongly. Today India still gets 70 percent share in H1B visa, and I don’t think any changes have been made to the numbers. It is only the compliance which has come through. Now, let me give the Indian government’s perspective. For the government of India, it is a strategic issue, because it is the largest foreign exchange earner for India. India has been able to maintain a $400 billion of foreign exchange reserve largely due to this export. It does create a lot of jobs; it has created roughly 4 million direct jobs in India and 10 times indirect jobs like drivers, cooks, catering services. So it does have an impact. Because of this foreign exchange, India has been able to buy a lot of large defence equipment from the US, place an order of civilian aircraft, send 2,00,000 students who pay $900 billion of tuition fee and other services. Now if we see from the US perspective, they have a constituency which is having unemployment because they have not upgraded their skills. So they cry ‘Indian workers are coming and replacing us’, and it becomes a sovereign issue along with a political issue. So it is a complex scenario. The good thing is after all the noise, no changes have happened in H1B. The number 65,000 stays, and additional 20,000 visa [issued for qualified people who have completed a masters degree from USA] remains the same; it is only the compliance which has been enforced and rightfully so because many companies are taking large [number of] H1B visas which is not the right thing to do. There are a lot of expectations from the 2+2 dialogue which is expected next month. How do you think things will unfold in terms of resolving trade issues? 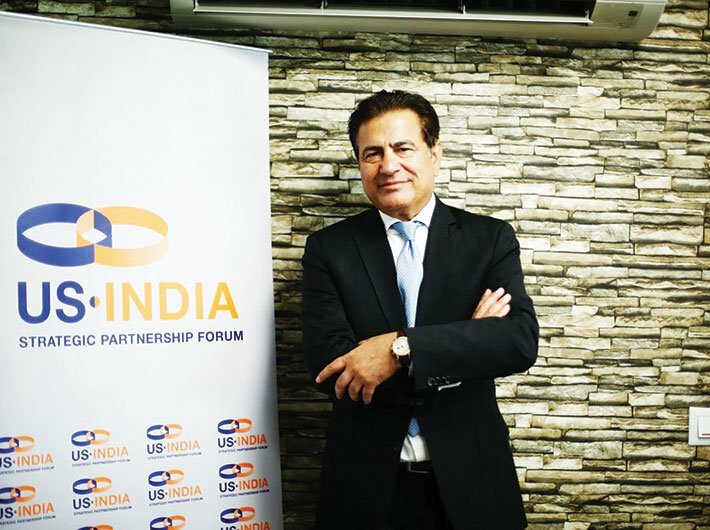 It will be a successful event – the reason I say so is that the Trump administration just gave STA1 [Strategic Trade Authorisation-1] rating to India, which means that India is one of the 37 countries in the world, which have access to all the high-end technology from the US without going through export controls. The other reason is that the US sees India as a very strong strategic partner and I am hopeful that COMCASA [Communications, Compatibility, Security Agreement] will be signed before that, so that should be helpful. I see a win-win scenario coming in at the 2+2. Tell us about the other initiatives you are taking to deepen India-US ties. We have multiple initiatives going on from the CSR perspective we have so many US companies and we are trying to consolidate them from that perspective. On education we are trying to bring more and more universities to India, rather than students going there. We are looking at encouraging more manufacturing in India with the defence companies. Twenty years from now India should become a large defence exporter. Think about the pharma industry: today they have a generic market, are one of the largest exporters and have 30 percent of the US market, and they bring $20 billion savings to the US government. We can do the same on the defence side. Defence is not so much hardware anymore, it is software. So there is talent in the country; we just have to repackage it and figure out how to export it. Please share an example of strong advocacy by USISPF that made a significant impact on the US-India trade relations? We are the only independent organisation focusing on India-US relationship, and we are not for profit. The objective is to look at the relation from a geopolitical perspective, from an economic perspective, from an innovation perspective, technology perspective. To give you an example of success, the US Senate passed a bill called CAATSA [Countering America's Adversaries Through Sanctions Act], and we put a major campaign having India as an exception. So our board members reached out to Senators and Congressmen. We did lobbying at the White House and all over. The result is that we could get an exception to India in CAATSA. Because if you allow the process in which India suffers collateral damage, it damages the relation for the next 20 years. Our member companies have in the last three years invested $27 billion in India, so we keep focusing on ensuring that the investment continues. The ways to investment continue to keep improving the ease of doing business in India. We keep on advising the government about the issues and keep working on that. India is the number one destination for FDI now. India has improved its rank on the Ease of Doing Business index. Has it led to more investment plans? This government is proactive in encouraging investment in the country, and the prime minister is the biggest cheerleader for that. Every time he visits any nation the FDI from that country goes up. If you look from the Ease of Doing Business perspective, investments are not made in Delhi itself, but at the state level. So we work with these companies looking for the state where it is easier to do business and invest. Some of the easiest places to work are the states where the BJP is governing. Uttar Pradesh recently held an investment summit. What sort of investment do you see coming in the state? Investments are coming in healthcare, education, and definitely the defence side. UP has made itself a defence corridor, and we are working to make that as a defence ecosystem from a manufacturing perspective. The US companies are coming in e-commerce, and they are setting up a warehouse in this area. There is a focus on MRO [maintenance, repair and operations].